We biked around Lake Constance in August and can’t speak too highly of this great cycling adventure! Mostly on well- marked, dedicated, flat bike trails winding through apple orchards, vineyards, sunflower and strawberry fields with stunning views of the lake. We loved exploring the pretty, small towns, castles and churches and savored lots of local delicacies. We swam in the clear, blue waters, soaked up some sun on pretty beaches, and enjoyed lots of art - interesting statues, an international sandcastle building competition, and an art exhibit at the top of Pfander Mountain. The joy of this type of trip is that you go at your own pace and get to spend time doing whatever appeals! We got lost almost daily, but somehow this added to the adventure... directions to hotels in bigger towns were poor, with maps often leaving out many road names. Accommodations were varied - some basic hotels and some charming family owned inns. Breakfasts were generous feasts and hotel staff helpful and friendly. This was our second Tripsite adventure and we will certainly be back for another!! I have to say the whole trip was amazing! We biked around Lake Constance! The hotels were clean and the breakfast at each hotel was delicious! Loved going around Lake Constance. We experienced three different countries and loved the food in each one. 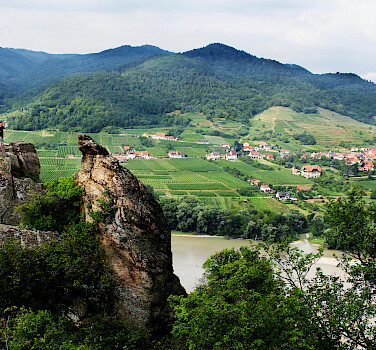 I loved riding through Grein and the Wachau Valley, just beautiful! Thank you for your feedback. I am sorry about the confusion about the arrival meeting. As it states in our day-to-day information, an arrival meeting is based on your starting city. As you specifically requested start in Passau, there is no meeting included. We can, on request, try to organize this (for future reference). I cannot explain why you thought you had been given 7-speed bicycles. Our newer Bosch step-less gear bicycles had been delivered to you, which are not 7-speed bicycles. I'm sorry you were not satisfied with our bicycles. It's good to keep in mind that bicycles used on these tours are very good quality, but may be a bit heavier than what you are used to at home. Thank you again for your feedback. I hope we can assist you with your next cycling adventure and we'll do our best to avoid any surprises! We enjoyed the relaxed pace, mingling with local village people and enjoying what Austria and Germany had to offer. The guides for the bike route were excellent, we had local people enjoying the bike paths with us and gave us a chance to practice our german. The accommodation and meals were of a high standard, after a day in the saddle the "Hugo" cocktails where very refreshing to end the day. Thank you Tripsite for a great holiday.